Can't Slow Down is the second solo studio album by American recording artist Lionel Richie. It was released on October 11, 1983 by Motown Records. It has sold over 20 million copies, and is Richie's best-selling album of all time. Five singles were released from Can't Slow Down, all of which hit the top ten of the Billboard Hot 100 chart, including two that reached #1: "All Night Long (All Night)" and "Hello". The album also won the Grammy Award for Album of the Year in 1985. In a contemporary review for The Village Voice, music critic Robert Christgau gave the album a "B+" and called it a "surprisingly solid" improvement, particularly with respect to Richie's ballad singing. He felt that its "jumpy international dance-pop" suits Richie more than the Commodores' funk had and predicted that, considering his "well-established appeal to white people," Can't Slow Down has the potential to become a "mini-Thriller". Don Shewey of Rolling Stone magazine gave the album four out of five stars and said that, although the ballads are monotonous, Richie successfully broadens his music for different listeners and draws on contemporary artists such as Stevie Wonder and Michael Jackson: "if you can't innovate, imitate. And the more honest they are about their sources, the better." In a retrospective review for AllMusic, Stephen Thomas Erlewine gave it four-and-a-half out of five stars and wrote that Richie took a conservative, melodic hook-based approach on an album whose hits showed him at his best and whose only weakness was a short running time. In 1999, Q magazine included Can't Slow Down on its list of the best Motown records of all time and stated, "Production values are high, his songwriting craft is at its peak and at least one track – the global smash 'All Night Long' – is an anthem to good times that makes the heart sing and feet twitch". The album reached #1 on the Billboard album chart. It also spent 59 consecutive weeks inside the Top 10 (including the entire year of 1984) and a total of 160 weeks (over three years) on the Billboard 200. After being the third best-selling album of 1984, it went on to win a Grammy Award for Album of the Year in 1985, beating out such heavyweight contenders as Born in the U.S.A. by Bruce Springsteen and Purple Rain by Prince. By 1986 the album had sold 15 million copies, eventually selling over 20 million. Can't Slow Down achieved the feat of having every single released hit the top ten on the Billboard Hot 100 chart. Two songs, "Hello" and "All Night Long (All Night)", both went to #1. Other hits include "Stuck on You" (US #3), "Running With the Night" (US #7), and "Penny Lover" (US #8). The ballad "The Only One" was a significant song from the album which was never released as a single, yet remains a popular staple of Richie's live performances. The single "Stuck on You" also reached #24 on the Billboard Hot Country Singles & Tracks chart (now Hot Country Songs). On May 6, 2003, a two-CD Deluxe Edition of the album was released in conjunction of the 20th anniversary of the album's original release date. This version included several mixes originally included on various singles from the album at the end of the first CD, including instrumental versions of the 12-inch extended mixes of "All Night Long (All Night)" and "Running with the Night". Disc 2 showcased demo or alternate versions of all tracks from the original album, plus additional unfinished songs from the same sessions, all previously unreleased. ^ a b Christgau, Robert (December 27, 1983). "Consumer Guide". The Village Voice. New York. Retrieved July 7, 2013. ^ "Soul Retrospective: Lionel Richie 'Can't Slow Down' – Soul Train". Soul Train. ^ "Lionel Richie". rollingstone.com. Archived from the original on 2 November 2007. ^ "Best Motown Records of All Time". Q. London: 161. October 1999. ^ Album chart positions from allmusic.com Retrieved 24 March 2009. ^ Schreiberg, Stu (1986-01-12). "Richie's record rise". The Santa Fe New Mexican. p. 55. Retrieved 2012-06-08. ^ "Atlanta Magazine Vol. 47, No. 3". Emmis Communications. July 2007. Retrieved 2012-06-08. ^ Can't Slow Down (booklet). Motown. 1983. ^ "Lionel Richie - Can't Slow Down". Austrian Album Charts. Hung Medien. ^ "Dutch Albums Chart – November 5, 1983". ^ "Offiziellecharts.de – Lionel Richie – Can't Slow Down" (in German). GfK Entertainment Charts. ^ "Lionel Richie – Can't Slow Down – New Zealand Charts". ^ "Lionel Richie – Can't Slow Down – Norwegian Charts". ^ "Lionel Richie – Can't Slow Down – Swedish Charts". ^ "SwIss Albums Chart – June 3, 1984". ^ "UK Albums Chart – November 6, 1984". ^ "Billboard 200 December 3, 1984". Billboard. ^ "Top R&B/Hip Hop Albums January 5, 1985". Billboard. ^ "Top Country Albums September 1, 1984" (PDF). Billboard. ^ a b "Forum – ARIA Charts: Special Occasion Charts – 1984". Australian-charts.com. Hung Medien. Archived from the original on 16 May 2017. Retrieved 2 April 2017. ^ "RPM Top 100 Albums of 1984". RPM. Retrieved 2 April 2017. ^ "Jaaroverzichten – Album 1984". Dutch Charts. Retrieved 2 April 2017. ^ "The Top 50 Albums of 1984". Retrieved 2 April 2017. ^ "Chart Archive – 1980s Albums". everyhit.com. The Official Charts Company. Retrieved 2 April 2017. ^ "1984 Billboard Year-End". Billboard. Retrieved 2 April 2017. ^ Barker, Glenn A. (9 November 1985). "Majors (Australia Spotlight)". Billboard. p. A-26. Retrieved 10 March 2019. ^ "Canadian album certifications – Lionel Richie – Can't Slow Down". Music Canada. ^ a b "Lionel Richie" (in Finnish). Musiikkituottajat – IFPI Finland. 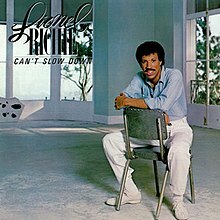 ^ "French album certifications – Lionel Richie – Can't Slow Down" (in French). InfoDisc. Select LIONEL RICHIE and click OK.
^ "Gold-/Platin-Datenbank (Lionel Richie; 'Can't Slow Down')" (in German). Bundesverband Musikindustrie. ^ "IFPIHK Gold Disc Award − 1985". IFPI Hong Kong. ^ "British album certifications – Lionel Richie – Can't Slow Down". British Phonographic Industry. Select albums in the Format field. Select Platinum in the Certification field. Type Can't Slow Down in the "Search BPI Awards" field and then press Enter. ^ "American album certifications – Lionel Richie – Can't Slow Down". Recording Industry Association of America. If necessary, click Advanced, then click Format, then select Album, then click SEARCH.